We have attractive room packages, each available at a great value. 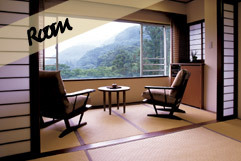 Large, remodeled Japanese-style rooms on the 7 floor with Japanese beds and salons. You will be served seasonal kaiseki cuisine at your room. This package comes with special kaiseki cuisine made from seasonal ingredients. Superb kaiseki cuisine carefully prepared by Mr. Murashima, head chef. We're sure you'll enjoy the seasonal taste of the finest ingredients of the season. * The items in the meal are subject to change depending on the season and availability. Thank you for your understanding. Dinner will be served at your room and will include 11 items of Japanese kaiseki cuisine (full-course). You may choose to have your dinner served at 17:30, 18:00, 18:30 or 19:00. "Fujinoyu" - There are two types of bath: stone and cypress. 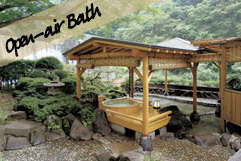 The pleasant sound of a mountain stream that flows to the Sukumo River can be heard from the open-air bath. Relax and enjoy the peacefulness until your heart's content.